By almost all accounts, cats hate water. In fact, most kitty owners would probably agree that their furballs are completely aversive to getting wet. Not only is bathing your cat possible and beneficial for her health—it can also be an enjoyable way to bond with your pet. …and you’ve come to the right place to find them. Cats are meticulous about self-cleaning and self-grooming. Watch a healthy kitty on any given day, and you’re sure to spot her licking herself from head to tail. Fortunately, kitties have evolved to have almost everything they need for basic maintenance of their fur, coat, and skin. This includes ample flexibility, saliva that acts as a natural “detergent,” and barbed-tongues that function like little combs to get rid of oil, dirt, dander, and other debris. They’ve rubbed up against something that’s either too sticky or too dangerous for them to lick off themselves. This includes things like wet paint, household chemicals, honey, peanut butter, pine sap, oil, and toxic plants. They’ve had an unfortunate run-in with a skunk (fingers crossed this never happens). They have certain health conditions, like obesity or allergies, which makes self-cleaning either difficult or not feasible for them to do on their own. They are older, and therefore have less mobility and endurance. The are a long-haired cat breed, meaning they require more frequent maintenance and brushing (especially since unkept hair can easily become matted, which may cause skin infections). If any of the above scenarios ever describe your kitty, then be prepared for the occasional splish splash in the bath. If possible, start bathing your pet when she’s still a kitten. Like brushing her teeth, bathing her from an early age will help her get more used to this unusual experience. Bathe your four-legged girlie during a period in the day when she’s normally more relaxed. Start with some gentle brushing and a nail trim. Brushing her before her bath helps you remove any excess hair and debris (which makes shampooing all that much easier), and trimming her nails minimizes the risks of scratches on you, your tub or sink, and your other furniture. Prepare everything you’ll need for the bath before inviting your kitty into the mix. You’ll need warm water (not hold or cold), a comb or brush, a non-slip mat, a washcloth, a towel, a plastic cup, and your favorite cat shampoo (you’ll learn about how to find the best product shortly). You may want to recruit a second pair of hands to help you, too! Once her hair is damp enough, you can begin lathering up some cat shampoo in your hands and then gently massage it into her coat and skin. Do it enough to get the oil and dirt, but try to gauge your kitty’s response and not go too far beyond her tolerance. When you’re done shampooing, use the same gentle technique to rinse it all off (so there isn’t any for her to lick later). Pat your cat dry thoroughly with a warm towel, and be sure to reward her with a fun toy and some high value treats at the end. Of course, it’s important not to overdo it when it comes to kitty bathing, since too much washing can strip your kitty’s fur of its natural protective oils and lead to dry skin and coat. For most cats, once every few months is probably more than enough, unless she gets covered in some sort of messy gook. Older, ill, and/or longer-haired cats may require more frequent bathing, but this probably shouldn’t exceed more than one per week. By now you understand why it’s necessary to occasionally bathe your feline friend. You’ve even learned some ways to make bath time go as smoothly as possible. You may be one of those enviable pet owners with a kitty who actually likes water (as some viral videos can attest to). At the very least, with enough patience and practice, you can probably help your cat learn to more or less enjoy her occasional scrub in the tub. But given how infrequently you’ll end up bathing your pet, you may wonder why you should bother using shampoo for cats at all (yes, there is such a thing). Can’t you just use your own shampoo, or baby shampoo, or even dog shampoo for that matter? The truth is, even the mildest and most natural types of human shampoo and conditioners can dry out and damage your pet’s coat, as well as irritate her skin. And many dog shampoos contain ingredients (“natural” or otherwise) intended to repel fleas and other parasites, which can lead to serious health complications if these ingredients come in contact with your cat (who’s smaller and, obviously, a completely different species). Our tip? Always use a high quality shampoo for cats when bathing your precious purr-monster. If you’re not sure where to start, the following tips and reviews should help. When it comes to choosing the best shampoo for cats, knowing what you don’t want can be as helpful as knowing what you do. When absorbed by the skin, these products can cause damage or organs and other tissues. Confusingly, many so-called “natural” ingredients still may not be safe for your kitty, including things like linalool and D-limonene, which are derived from the peels of citrus fruits (which are toxic to kitties). Even tea tree oil may be unsafe for your kitty in large concentrations (that is, more than about 0.1-1% or so). Instead, look for shampoos that have minimal to no artificial additives, as well as soothing ingredients like aloe and lanolin. Fragrance-free may be an appropriate option, but you can also find some nice-smelling products that won’t break the bank nor subject your squeaky-clean cutie to harmful ingredients. Selecting the right cat shampoo depends on many different factors, including the quality of ingredients (explored briefly above), your cat’s health status, your cat’s breed, and even your cat’s age. It may be helpful to chat with your vet about finding the right feline-friendly shampoo product for your four-legged cutie. This is especially important if your vet decides your animal needs some kind of medicated shampoo via a prescription. That said, these top 3 choices may be a great place to start your search. This product contains keratin and lanolin which help build resilient and shiny hair and fur. It’s effective for all coat of hair and is gentle enough for even weekly use in cats who may need frequent bathing. It’s been specially formulated as “tear-free” meaning it won’t irritate sensitive eyes or skin. Some users find that this shampoo doesn’t produce the expected amount of lather and suds. However, it rinses out well and leaves their cats’ hair smooth and silky. This cat shampoo comes in a wide variety of scents and styles. It’s generally recommended for cats with itchy sensitive and dry skin (e.g., allergies). The oatmeal and aloe vera ingredients not only soothe irritation but can also help heal skin and resolve dryness. Safe to use on cats 6 weeks and older, it won’t disrupt topical flea medications. It has a pleasant scent and includes wild cherry and vanilla essence. It can be formulated with tear-free ingredients, although as advised earlier you should still avoid getting shampoo on your cat’s face. Customer reviews are overall positive, with some users reporting minimal improvement in apparent itchiness for their pets, but clean and good-smelling coats. This favorite shampoo is made with 99% natural, cat-safe ingredients that are biodegradable, pH balanced, and dye-free—meaning it’s delicate on your feline’s skin. But as gentle as it is, it’s also effective, too (with higher “surfactant” levels, meaning it can lower liquid surface tension, an important part of cleansing). This makes those occasional bath times much more worthwhile. Wondering what they mean by “4-in-1”? This product pledges to soothe, clean, condition, and de-tangle your cat’s coat. Owners of both short- and long-haired kitties have noted its effectiveness, and the consensus about the vanilla smell is overall positive (light yet fresh). Many users have even found their cats shed less and feel much softer overall following their bath. Our guess? The soothing and restorative power of oatmeal extract is probably a helpful factor here. One of the best shampoos for kittens out there is this product from the brand Espree. It’s so gentle—made with 100% organic aloe vera and jojoba oil, to name just some of its few ingredients—that it’s safe to use on young kittens as well as other cats with sensitive skin. You can also use this shampoo on pregnant felines, since it’s safe for mom and litter. Use this hypoallergenic shampoo on your curious kitty who gets into something she shouldn’t or makes a little mess and needs some help cleaning up. 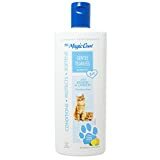 It’s also a good product to have on hand if you just want to train your kitten from a young age to get used to bath time! Most reviewers love the smell, though a few noted the “baby-powder” aroma wasn’t their cup of tea. Overall, it’s a product with glowing reviews that can leave you with a glowing kitty. This is the Oster brand’s second appearance on our top buy list, and for good reason. 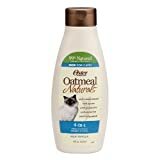 This cat dandruff shampoo contains skin and hair-healthy omega-3 fatty acids, as well as soothing coconut and oatmeal extracts to reduce the amount of dandruff (yes, cats can have it, too). It even contains a natural ingredient called stinging nettle extract to help control shedding. Free of artificial chemicals, this gentle biodegradable formula can be safely used on animals with allergies. It can also help animals find relief from their skin following flea bites and infestations (though it can’t be used to kill fleas). What’s particularly great about this soothing shampoo is that in addition to reducing dandruff, it still effectively cleans your pet’s hair, leaving her coat silky, soft, shiny, and smelling great. Dry shampoo is a great option if, despite your best intentions, your cat resents going in the water with every ounce of her energy. When the struggle and stress just isn’t worth it for her or you, or if you simply just need to do a little spot treatment, this product from Vet’s Best is a quick and simple solution. 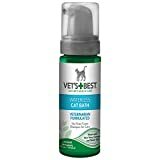 With ingredients like aloe and vitamin E, this American-made, leave-in product deeply moisturizes your cat’s coat without clogging pores or leaving residue. Both formulated and recommended by veterinarians, it won’t interfere with topical flea medications. Simply pump the foamy product onto your cat and massage in. For best results, manufacturers recommend letting your cat’s hair air-dry and before brushing it to remove any excess debris. While some users report not liking the smell, most comment on its easy-to-use application for small messes and odor elimination. There may come a time when your cat needs a little spa treatment. However infrequently this may happen, it’s best to be prepared beforehand by having a high quality cat shampoo on hand, as well as some handy bathing tips in your repertoire. And with a little practice, bathing your kitty may even become enjoyable for you and her, and a great way to give her some much-deserved TLC. To top it all off? You’ll be left with a sweet-smelling, clean, and gorgeous-looking feline friend to snuggle with.